A Year of Being Here: Thomas Berry: "An Appalachian Wedding"
"An Appalachian Wedding" by Thomas Berry. Text as posted on the poet's website. 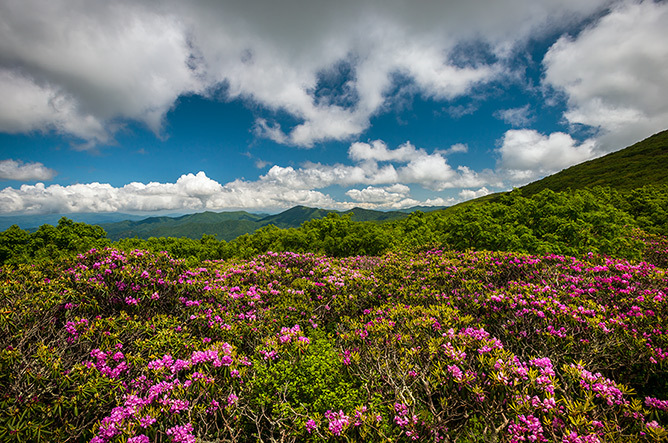 Art credit: "Spring in the Mountains—Blue Ridge Parkway [Appalachia] Spring Landscape Photography,'' photograph by Dave Allen Photography. Curator's note: As this poem was written for the wedding of musician-composer Paul Winter, I thought you might enjoy Winter's "Mountain Wedding" (click arrow below). I don't know if Winter wrote this piece of music for his own wedding or not, but it's fun to imagine so. Enjoy. This was a divine addition -- I envisioned all of the wedding party and guests joining hands and spiral dancing love into the galaxy!